Noticeably absent from President Obama’s recent jaunt through Europe is any update or attention on the Balkan nations of Croatia, Bosnia and Herzegovina, Serbia, and the fledgling state of Kosovo. This absence is not surprising. The Balkan states, scene to a brutal civil war in the 1990’s, have remained seemingly hidden from international media of late, bar a few exceptions. Now, 14 years after the massacre at Srebrenica, it is time for politicians on both side of the Atlantic to push past the negative stigma of the area and re-examine the Balkans. The Balkans still confront several large problems. First, corruption remains rampant in nearly every country in the region. Croatia experiences bouts of violence at the hands of a powerful mafia that continues to exert significant control. Among the victims are politicians, journalists, lawyers, and policemen. To speak out against the corruption and the mafia is to face swift repercussions, as the murders of journalist Ivo Pukanic and the daughter of a well-known Croatian lawyer unfortunately demonstrate. Others are on the receiving end, as the pockets of politicians have an odd propensity to suddenly become thicker. Bosnia and Herzegovina, still divided mostly along ethnic lines, consists of the northern Serbian Republika Srpska and the southern Bosnian/Croatian Bosnia and Herzegovina. The split country faces the same corruption as Croatia, along with continued ethnic tensions from the not-too-distant war. The bifurcation has proved difficult to manage, as the rotating Presidency, shackled by an aging Dayton Agreement, finds itself increasingly unable to effectively tackle the economic and criminal problems plaguing the troubled nation. Indeed, the High Representative overseeing the troubled country, per the Dayton Accords, recently flexed special powers to revoke controversial ethnically-motivated legislation from the Bosnian Serb legislature. The legislation, which was annulled peacefully, alleged that the southern Bosniak legislature was denying the northern Bosnian Serbs access to some of their rightful powers. Clearly ethnic tensions—once hoped to have been forgotten—still exist. Meanwhile Serbia, along the same lines, is struggling to come to terms with an independent Kosovo. Although they recently successfully initiated an action in the United Nations to take the matter of Kosovo’s February 2008 Declaration of Independence to the International Court of Justice (ICJ), which will assess the legality of the declaration, the ICJ decision will not be binding. It will, however, have a significant impact on Kosovo’s standing with the international community, many members of which have yet to recognize Kosovo—including several EU member states. Serbia still needs to extinguish lingering remnants of extreme nationalist political parties and bring the remaining war criminals to justice—a benchmark the EU insists Serbia must pass, and soon, if it is to apply for EU membership in 2009. While Serbia did make progress on this front with the arrest and extradition of Radovan Karadzic in the summer of 2008, other noted figures from the war are still at large, including Ratko Mladic. These figures have achieved almost mythical status as anachronous Serbian heroes still supported by a Serbian population that is highly averse to the ICTY and similar international efforts in the Balkans. Indeed, Karadzic, wanted in association with the genocide at Srebrenica, lived openly in Belgrade among the Serbian populace for many years, brazenly practicing freely as a doctor of alternative medicine. Karadzic’s extended abeyance of justice suggests even elements of the Serbian political realm are still hesitant to consider the extremist nationalism Karadzic represents as extinct. A solution, however, is available, and can provide many quick advantages and lessons arguably applicable elsewhere. First, the EU needs to provide more structural teams and programs, such as the EU's EULEX program in Kosovo, to improve the judiciary and rule of law in each of these countries. The stick, rather than the carrot, might be more efficacious, but either will sufficent as long as the burgeoning Balkan nations are nudged to reform their court systems and crack down on corruption quickly and effectively. If these tactics prove successful, they can quickly be applied to Romania and Bulgaria, two recent EU entrants still plagued by corruption. Furthermore, these are important lessons that need to be learned not just in Europe, but in the Middle East. Corruption constantly undermines U.S. objectives in Afghanistan and Pakistan, and if EU tactics in the Balkans can prove successful, there might be several similar applications that can be exported and applied to Iraq, Afghanistan, and Pakistan. Second, the Dayton Agreement urgently needs to be updated. With the EU struggling for consensus on a European response to the economic recession, and the U.S. occupied in the Middle East, were the Balkans to erupt in violence again the results would be disastrous. 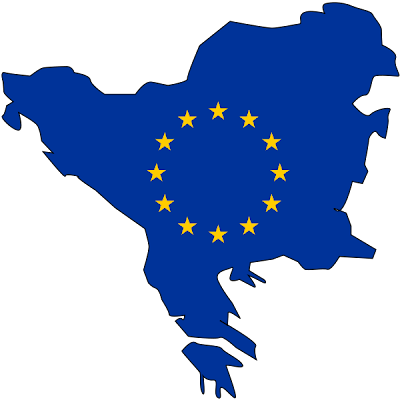 The EU in particular, here, can put into action its newly created European Security and Defense Policy (ESDP) and work to ease ethnic tensions in the Balkans as a requirement for EU membership for Croatia and Serbia. Preventative diplomacy can be effective when properly planned and implemented, and allowing Balkan sores to fester unaided would be a grievous mistake. While the negotiations necessary to revamp the agreement would not prove simple by any stretch of the word, a hard-fought diplomatic consensus would generate positive headlines for the EU at a crucial juncture for the divided organization on the eve of the second Irish referendum on the Lisbon treaty. A pipeline dream would be a solution to the thorn in the side of Serbia: Kosovo. Although the legality of Kosovo's declaration of independence is currently under review by the ICJ, further dialogue on the matter would not go unwarranted. Finally, both the EU and the U.S. need to commit more resources to the region. Programs such as EULEX are a start, providing critical resources, training, and experience to complement an inexperienced and young Kosovar government. If, however, these countries are forced to face the brunt of the economic recession alone, with reduced aid from the international community, the unrest the recession will generate has the potential to ignite old nationalist flames. The challenge is immense, but the rewards are bountiful, and to ignore lessons from history would be a grave mistake. The resources are there, all that is needed is the political motivation and capital to recognize the potential problems and work to counteract them now, before they grow too large. The international community cannot afford to forget about the Balkans again. please ue forget, forget balkania ! !